The single was judged to rank alongside hits by Public Enemy and Band Aid in a list put together by experts for Time Out magazine. 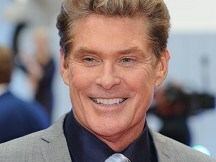 The Hoff - who became a chart star in Germany - performed the track shortly after the fall of the Berlin Wall in 1989. And it went on to become a symbol of the spread of democracy in eastern Europe. It was ranked in tenth place for Time Out's list of 100 songs that changed history, which was topped by Public Enemy's Fight The Power. A panel including historians Michael Wood, Bettany Hughes and Dan Cruickshank, alongside promoter Harvey Goldsmith and Suede's Brett Anderson drew up the top 100. Public Enemy 's Fight the Power came first, followed by Band Aid's Do They Know It's Christmas? which kick-started famine relief in Ethiopia. Ramy Essam's Irhal, the anthem of Egyptian protests against President Mubarak, was third, fourth place went to Sam Cooke - A Change Is Gonna Come (1964) - and fifth to John Lennon - Imagine (1971). Former Knight Rider and Baywatch star The Hoff had topped the charts in Germany with Looking For Freedom in 1989 before the Berlin Wall began to come down. He went on to perform the track from the partly demolished wall a few weeks later. The Britain's Got Talent judge went on to moan that his pivotal role has not been fully recognised, saying in 2004: "I find it a bit sad that there is no photo of me hanging on the walls in the Berlin Museum at Checkpoint Charlie." Time Out music editor Eddy Lawrence said of the winning choice; "Fight the Power was incendiary because it was brutally explicit and unequivocal. What makes this our number one, is that it transcended its locality and became a call to action around the world: in Ireland, in Serbia, along the fault lines of the crumbling Soviet bloc and beyond."